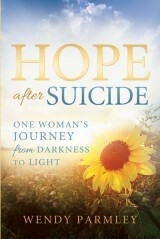 Welcome to the official website of author Wendy Parmley and the book Hope after Suicide: One Woman’s Journey from Darkness to Light. Reinvent your definition of saved, perfect, and forgiveness as you read this true narrative of a woman opening her heart years after her mother’s suicide and learn how to overcome any loss in your own life. This entry was posted in Uncategorized on October 23, 2013 by cedarfort.